Behind some modest vineyard names (lieux-dits) we find, almost invariably, great wines. One of these is Kronenbourg, which is the offshoot east of Grand Cru Schoenenbourg in Riquewihr and Zellenberg. Kronenbourg offers extremely persistent, dry wines from Riesling and Muscat of a more classic cut than the famous neighbor to the west. 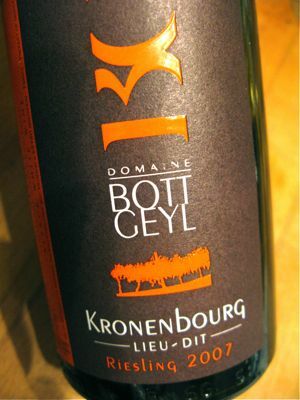 2007 Riesling Kronenbourg from Bott-Geyl in Beblenheim has medium yellow color. The aroma is restrained and young with white pears, ripe apples and a low-key spiciness. The taste is very young with layers upon layers of dense fruit, high but ripe acids and monolithic salinitity in the aftertaste. A youthful wine with lots of potential, that is biodynamically grown and certified according to the Agriculture Biologique. Price: € 10.85.